The Great British Food awards were launched in 2014 to celebrate the UK's finest home-grown ingredients, as well as the hard-working people who produce and cook with them. This year there are lots of new categories, celebrity judges and amazing prizes to win. 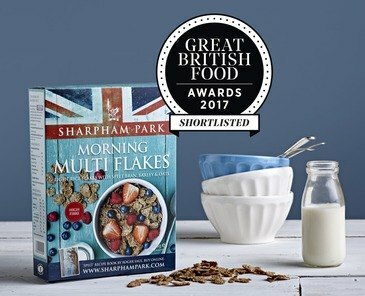 We're very proud to say one of our favourite cereals - Morning Multi-Flakes, has been shortlisted for Best Cereal! This product has made it through the final judging round and will now be put to the test by British two-star Michelin chef, Michel Roux Jr., to discover if they are worthy of the winning title. Deliciously crisp and light, multigrain rice flakes with spelt bran, barley and oats. Our Morning Multi-Flakes are high in fibre and contain less than 10% sugar making them the perfect start your day. Why eat our Spelt Flakes? Spelt has been grown in Somerset since the start of the Iron Age and has gained in popularity in recent times because it's an excellent source of dietary fibre, protein, vitamins and minerals. It's both easy to digest and leaves you feeling fuller for longer making it a fantastic alternative to conventional wheat. Make spelt your ‘marching grain’ like the Roman Army did! Our spelt is grown organically on our sustainably managed farm on the Somerset Levels.